Update: It's not strictly a sequel to the Samsung Galaxy Watch, but we've just placed the Galaxy Watch Active in our list below. It's a sportier version of our best smartwatch without the rotatable bezel, plus the price is lower too. Today's best smartwatch models can perform a ton of tricks, such as enabling you to search the internet with your voice, track your location with GPS or even monitor your heart rate to protect your overall health – with our without pairing to one of the best smartphones on the market. Our full reviews of the Samsung Galaxy Watch Active and Fitbit Versa Lite have both landed this month. The former is in our list below, while the latter didn't rank in this list. So far, we've yet to see any big rumors for smartwatch launches in April. 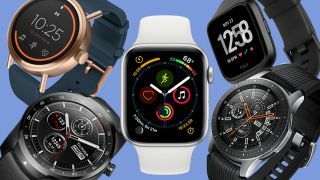 We've tested the vast majority of the top-end wearables you can buy right now from the Apple Watch to Fitbits, Garmin trackers to Tizen-sporting Samsung smartwatches. There's also Wear OS (you may have known that in its previous incarnation called Android Wear) which is Google's own wearable operating system in the vein of Apple's watchOS. Smartwatches come and go from the ranking depending on the rest of the competition at the time, and bear in mind we may see products like the Honor Watch Magic appear in the list after we've tested them properly. Our best smartwatch you can buy right now is from Samsung, and instead of opting for the expected Gear S4 name it's called the Galaxy Watch. Following on from the Gear S3 series and the Gear Sport in 2017, the latest Samsung Watch is much improved. What's next? The Apple Watch 4 was announced and released in September 2018, and we don't expect to see the Apple Watch 5 until the same month this year. Fossil has developed a lot of expertise in the wearable tech space over the last few years, and this has all culminated in the best smartwatch the company has made so far. The Fossil Sport is a top-end watch with a lower price tag than the two devices above in this list. It features GPS, a lightweight - yet premium - design and at least two days of battery life from a single charge. Fossil has packed a Snapdragon Wear 3100 chipset inside, which is the latest update from Qualcomm that offers a smoother experience than you'll get on a lot of older Wear OS watches. It doesn't sport any truly unique features, but the overall package of the Fossil Sport may be the best watch for you. That'll especially be the case if you're looking for a fitness watch that comes with Wear OS software and won't look odd on your wrist when you're going about your day. What's next? Our Fitbit Versa Lite review is now in, and it may be worth a look if you're looking to buy the Fitbit Versa. It isn't as feature-packed, but it's cheaper than the original Versa. You've already heard all about the Samsung Galaxy Watch, but what if you just don't want a large version of its wearable? Samsung has shrunk down most of the tech available in the Galaxy Watch into this more sport appropriate package that's slimmer, lighter and, arguably, more comfortable. The Galaxy Watch Active features a 1.1-inch 360 x 360 display that while being bright and beautiful allows for a smaller watch to be strapped around your wrist than a lot of the other devices in this list. It still comes sporting all of the top-end fitness features you'd expect from Samsung's Tizen watch range, but it lacks the rotating bezel or an LTE option that you'd get from the top-end product. The best part is how the price has shrunk to match its size. It's certainly not a cheap smartwatch, but when compared to the original RRP of the Galaxy Watch you may prefer to opt for this version that's remarkably similar. Don't like the design? There's also the TicWatch S2. That's a remarkably similar watch to the TicWatch E2, but it comes with a slightly more rugged look for adventurers who want a watch that can take a beating. Check this out if you're happy to spend a bit extra.